Home Home Credit OPPO Sarah Geronimo Get the all-new OPPO F1 at 0% interest from Home Credit Philippines! Get the all-new OPPO F1 at 0% interest from Home Credit Philippines! 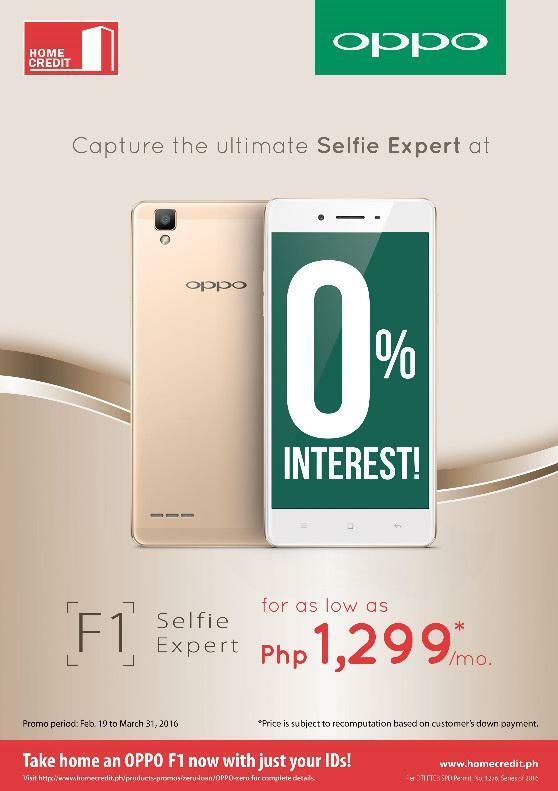 Home Credit Philippines, a global consumer finance company, brings an exciting new offer for those seeking to buy OPPO’s latest smartphone, the OPPO F1. Through installments provided by Home Credit, customers may purchase an OPPO F1 at 0% interest rate and even without a credit card starting from February 19, 2016, until March 31, 2016. The OPPO F1, which retails at P11,990, was recently launched by global electronics and technology service provider OPPO with the support of Home Credit Philippines and OPPO’s first local ambassador, Sarah Geronimo. In partnership with OPPO, Home Credit makes shopping for the OPPO F1 affordable and convenient. To apply for a loan, a customer needs to present at least two IDs and an initial cash payment. The loan is approved in less than 30 minutes, and the customer may leave the shop with the purchased good in less than an hour. The payment term is 6 months, with a monthly payment of as low as ₱1,299, based on 35 percent initial cash payment. The OPPO F1 features a premium metal body with velvety metallic feel; a 5-inch 2.5D-arc-edge screen protected by Corning Gorilla Glass 4; and a 13-megapixel camera. It is powered by a Qualcomm Snapdragon 616 octa-core processor with 3GB of RAM and 16 GB of storage, which you can extend up to 128GB. But an even more important advantage of the phone is its 8-megapixel front camera, which allows for taking amazing beautified selfies. The promo is available in 245 partner stores nationwide, in all Home Credit-serviced areas, including OPPO concept stores, Rulls Cellphones and Accessories, Silicon Valley, and Wellcom. The full list of the stores is available at Home Credit’s official website, www.homecredit.ph. The partnership of OPPO and Home Credit Philippines proves to be successful. For December 2015 and January 2016, Home Credit contributed more than ₱50,000,000 of additional sales of the OPPO Neo 7. For more information about the OPPO F1, go to http://www.oppo.com/ph/smartphone-f1/.